It’s a little tart and tangy. It’s a little sweet. It’s big in flavor and is delicious! 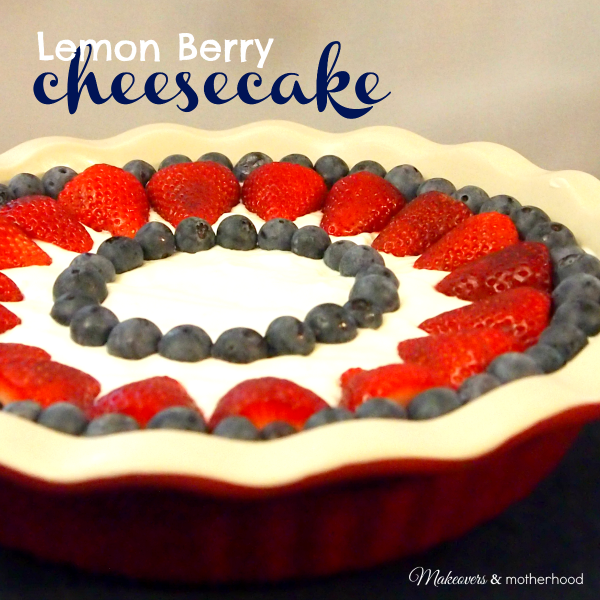 This Lemon Berry Cheesecake is a HUGE hit and yet so simple to make! It’s perfect for summer cookouts, baby showers, and for 4th of July festivities! Take the clear plastic lid off the pre-made pie crust. Place your hand on the crust itself and turn upside down. Holding your ceramic pie plate upside down, center and gently lower it over the upside down graham cracker crust you are holding on your hand. Gently turn both the pie plate and the crust right-side up together. If the pre-made crust is smaller than your pie plate, push down the sides of the crust to break them. Let them naturally position themselves in the pan. Yes, I know, I have just broken the lovely pre-made crust. But let’s be honest, most graham cracker crusts crack when you dish out your dessert anyways, so this is simply a step of convenience. Then, after spooning the cheesecake into the crust, smooth it so that no part of the crust is showing. This makes for beautifully decorating the top! As far as decorations, I garnished this cheesecake in the spirit of the 4th by only using blueberries and halved strawberries. Raspberries are also fabulous with the lemon of the cheesecake! Tart and tangy, but simply sweet and delicious! Beat cream cheese, drink mix and sugar in large bowl until well blended. Gradually add milk, mixing until well blended. Refrigerate about an hour before eating so it has time to set up. Happy 4th of July and happy eating!